Trumac Healthcare is one of the leading Multivitamin Tablets Manufacturers Suppliers all over India. 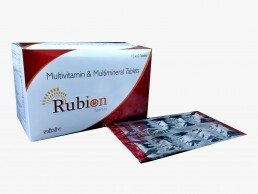 Rubion Multivitamin and Multimineral Tablet is a potent, convenient way to help fill in the nutritional gaps in your daily diet. • Helps support an active lifestyle. • Aids in fulfilling key missing nutrients due to dietary deficiency, stress, environmental pollution. • Assists in maintaining physical and mental alertness..